Zinjidere had the reputation of being a ‘corner of Switzerland’ transplanted in Cappadocia. The town of five hundred homes brought to mind a picturesque Swiss Alpine village with summer homes and cottages. It served as a resort area for Caesarea. Caesarea Mazaca had already ceased being a bishopric. The Greek bishop had moved to Zinjidere, making it the focal point of wide Christian activity. The ancient name of this lovely town was Flavianus. A Greek theological seminary was the center of training for priests who following graduation were commissioned to serve in near and distant parishes in Asia Minor. There was also a commercial school, boys’ and girls’ gymnasiums, two Orthodox orphanages and later an Evangelical orphanage for boys. 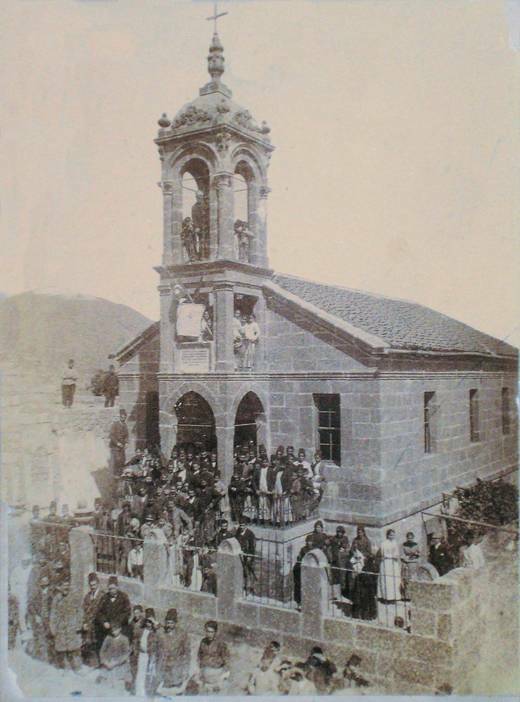 In 1878, the year that Kalliopi was born, Stephanos bade farewell to the church he had started in Ürgüp. He had heard that a small congregation was being formed in Zinjidere, five kilometers south of Talas. As soon as this nucleonic flock learned that Stephanos had left Ürgüp and moved to Talas they invited him to become their pastor. So the whole family moved to Zinjidere with the expectation of starting a functioning church. He was pleasantly surprised to find out that during his absence his own mother had turned to Jesus Christ. However, his other relatives were all adamantly against him. He was now settled in Zinjidere where his ensuing years were to be fully devoted to the service of Christ. This place was to be his home. In 1893, he built a beautiful church building on a hilltop of the town. All the necessary materials ― stones, lumber, steel, windows, etc., ― were provided at the proper time so that each step of the construction advanced without delay. Endowed with skills of builder, organizer, financial manager and administrator, the pastor successfully progressed from one stage to the next, until the ambitious project was completed. All told, the work took only one year. An interesting story related to the building of the church became widely known. There was a well-to-do citizen of Zinjidere whose name was Karakash. One day Stephanos approached him, spelling out the needs for the building. Karakash was quite a peculiar person. He answered, “I cannot offer anything at this time, but in my will I will mention that the church is to receive forty gold liras.” This sum in those days amounted to $160. Stephanos said, “We need the money now. We will greatly appreciate your gift, even if it is less, but given without delay. If you give five gold liras now, this amount will have greater value than the forty to be collected sometime in the future.” Mr. Karakash was set in his decision. “I’m sorry; I cannot offer anything at this time, but in my will you will find the promised forty liras.” So Stephanos received a copy of the will, with the hope of getting the money in the future. Surprisingly, Mr. Karakash’s days were cut short and he died. Stephanos immediately collected the promised forty gold liras. This portion of Mr. Karakash’s legacy was the only amount that was easily collected. The other parts of the will got involved in long court cases among relatives. Sophia, Stephanos’ wife, remarked, “This is a clear sign of God’s working on our behalf.” The dedication of the new church was in 1878, celebrated with a great meeting of praise and thanksgiving. Stephanos was thrilled at what the Lord had enabled them to do. He preached his first sermon with great fervor. The many hours he had devoted to prayer, organizing, raising money, and purchasing all the materials, to say nothing of the hard physical labor that he himself had put into the construction were now amply rewarded. He was mindful to invite a professional photographer from Kayseri to take a beautiful picture of the new church with its congregation. People were gathered in every available space – in front, on the side and even in the belfry, which was yet without a bell. This was the start of the Evangelical Church in Zinjidere. The church had a simple, but beautiful sanctuary. There were no other rooms. It was built with cut red stone adorned by an imposing belfry with archways on each side, topped with ornate decorations and an embellished pinnacle, all made of hand-cut stone. Stephanos, who always gave great emphasis to educating the children, built a one-room school beneath the sanctuary. Also a parsonage was built behind the church. Any visitor coming from Talas was thrilled at the sight of this beautiful edifice rising above the town. High off to the right, magnificent Erjiyes (Mt. Argios) lifted its stunning snow-capped peak toward heaven. Stephanos was farsighted enough to build a belfry without having any idea of where the bell would come from. His God was ‘Yahweh Jireh’ (Genesis 22:14). The American Board missionaries in nearby Talas were amazed at the remarkable undertaking of this pastor and his congregation. Immediately they felt that they should extend tangible assistance. Not finding any place to purchase a bell in Anatolia, their thoughts sped to the United States. They took the initiative and ordered a beautiful bell from the Commonwealth of Massachusetts. The bell safely crossed the ocean and the Mediterranean by ship. From Constantinople, or perhaps Smyrna, it was transported inland. There was great rejoicing when Stephanos and the church members beheld the magnificent bell provided for them by one of the New England Congregational churches. They hoisted it up to its place with great care. After trying it out, they impatiently waited for Sunday morning when the town would hear its sound for the first time. When Sunday morning arrived, everybody in Zinjidere heard the deep, mellow tones reverberating from the surrounding hills. It was a moving celebration when this very special gift was dedicated. Everyone was remarking that none of the Orthodox churches had such a melodious bell. When Stephanos died in 1916, he was buried in the yard of this church which he had loved so dearly. The sad years of World War I, followed by the Anatolian War between Turks and Greeks brought unimaginable suffering and lamentable consequences. With the loss of the war by the Greeks and the retreat of their army from Smyrna, the ominous end of Grecianism in Anatolia became a sad reality. Following the defeat of the Greeks, came what was later known as ‘exchange of populations’. All Greeks living in Anatolia were obliged to leave their country of countless generations and move to Greece. Naturally, the whole Sirinides family as well as all the members of the church had to move to their new country. The church building of course had to be left behind. Today it is being used as a museum by the Turks. But the congregation could not part from their treasured bell. While they were discussing what to do with it, a well-to-do lady of the congregation offered to pay for the transport of the bell from Zinjidere to Athens. 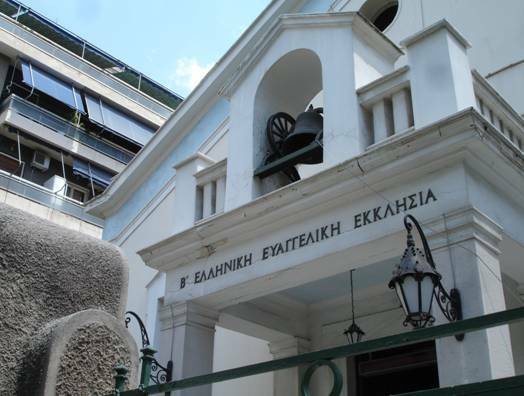 The Greek government assigned the Zinjidere Evangelical community to an area of Athens known as ‘Nea Smyrni’ (New Smyrna). Near this section of Athens, in Koukaki, the Second Evangelical Church was being built under the pastoral leadership of Xenophone Moskhou, minister of the Evangelical Church of Smyrna until the catastrophe occurred in 1922. The congregation of refugees did not know where they could obtain a bell for their church. In the process of time, the people from Zinjidere arrived in Nea Smyrni. Along with the few meager items they carried with them was this valuable bell carefully packed in a crate. This same bell once again brought joy to a new church founded by the immigrants from Asia Minor. Profound thanksgiving and joyful praise ascended to God as the bell again sounded forth its deep, mellow tones. Today the area of the church is entirely made up of high-rise apartment buildings. The church sits on its little island in the midst of towering buildings all around. The bell still peals every Sunday, inviting people to come to church. The present pastor is George Adam.